When you look at the Avastar Character you might have noticed that the entire avatar looks like it was made of one mesh. There are no seams between head, upper body and lower body. But actually the Avastar body is made of 3 meshes. And normally one would expect to see seams between the meshes. So what is the trick here? The answer is: We use Blender’s Data Transfer Modifier for welding the edge Normals of adjacent objects. You see in the image that the Normals of the adjacent mesh vertices do not point in the same direction. Hence you usually get visual seams at these locations. By default the Modifier attempts to modify all Normals of the active Mesh. However in our case we only want to adjust the Normals on the edges. So we can reducethe modifier influence range to a minimum. You get the best match of course when the adjacent objects have vertices at the exact same locations. Note: Please always enable this option. Otherwise the Normals do not get exported. And the final result is a set of nicely welded Normals that make the two adjacent meshes look like only one single object. Mischief accomplished. 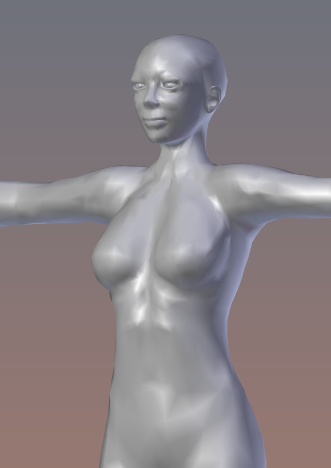 The Data Transfer Modifier copies the Normals over. It does not average the Normals! 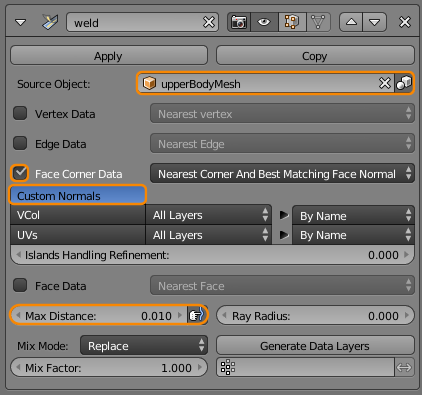 This may be important to know when you for example try to combine your mesh head with the Mesh body of another creator! Avastar hs its own welding function that can be enabled during Exporting of the meshes. This welding function is averaging the Normals instead of copying them. In some cases you might prefer the averaging over the copy as done by the Data transfer modifier.